The 356-based Speedster was famously dubbed the bathtub Porsche, after its upside-down bathing apparatus-like appearance. Today's Nice Price or Crack Pipe 911 Carrera is claimed to have once been waterlogged, but would that make buying it mean you'd be taking a bath? Yesterday's witness protection program disguised 1965 Jaguar E-Type had 66% of you both asking why the long face? and voting Crack Pipe for a litany of modifications that seemed egregious at nearly any price. Today's competitor to that British sportster is also modified from stock, albeit not in quite so shockingly individualistic a manner. Tom Cruise famously flooded a Porsche in the raunch-com Risky Business, incurring the wrath of Guido the Killer Pimp through his entrepreneurial endeavors that were his attempt at rectifying the situation before his parents got home. Today's 1995 911 Carrera 2 lacks Tommy Boy, homicidal pimps, and home business tax write-offs for plastic sheets and Astroglide. It does however involve water sports. This screaming yellow zonker is representative of the final iteration of the air-cooled 911, a fact that will prove an interesting conceit considering its brush with the life aquatic. 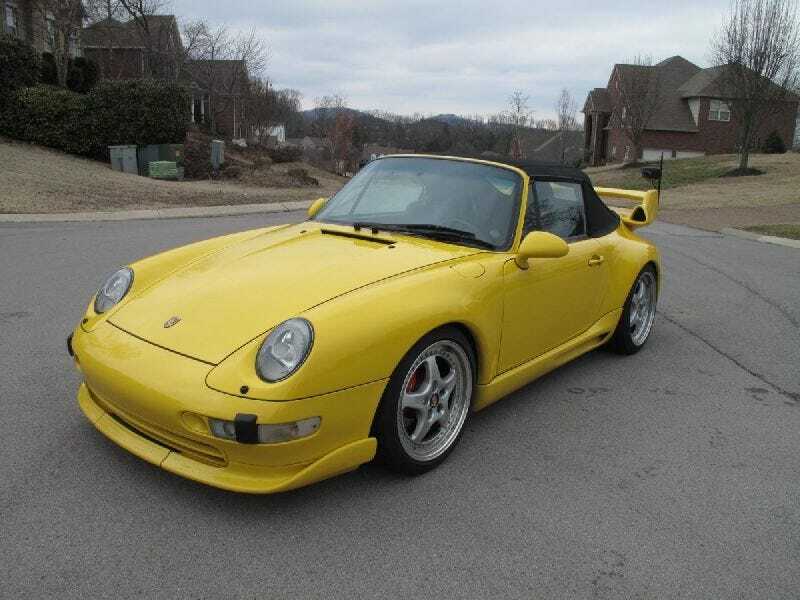 Before considering the virtues of this low mileage - 42,000 - convertible 993, it should be pointed out that it once was flooded up to its glovebox in Tennessee tapwater. The seller claims that the damage done was minimal, not even affecting the engine management computer under the driver's seat. If that's true, perhaps Porsche should start designing cell phones. Despite emulating the Little Mermaid, the 3.6-litre flat six anchoring the rear is claimed to be in excellent shape, having received a recent syn-oil change, plus new belts and plugs. In front of that 268-bhp six is a spankin' new flywheel and six speed gearbox - also replenished with fresh lube after its bath. The transaxle on the 993 sits in a multilink rear end that quashed much of the snap oversteer tendencies of the barbell-like 911, potentially preventing you from going backwards off an apex and into, oh say, a lake. Of course, YMMV. Electrics are claimed to have likewise survived the car doing dunkin' donuts, although the electric motor for the top has apparently been sacrificed for massive amps somehow required to power the sound system. That stereo proves that turning this 911 into a koi pond wasn't the only questionable choice made by its past owners. Other foibles are a heater that mysteriously doesn't heat, A/C that doesn't cool, and a set of instrument dial facings so yellow you might have an uncontrollable urge to pee just through their power of suggestion. Of course, that wouldn't be the first time those seats and carpet got wet, so knock yourself out. Visually, those gauges and the rear seat-replacing badge of doucheness speaker enclosure offer some individualism to an otherwise stock interior also featuring a set of pretty gnarly sport seats. Outside, the GT2 snorkel spoiler presages future excursions underwater, and ground effects bodywork ensures dolphin-like capabilities while visiting Davey Jones' Locker. Red PORSCHE-emblazoned calipers are evident behind the five spoke alloys, and the top, while currently a manual affair, looks to be in good shape. In fact there doesn't seem to be any direct evidence of the car's claimed flooding, and the seller says that the Tennessee DMV gave it a clean bill of health after initially slapping it with a salvage title and some water wings. As recent storms across America's South prove, you can't always prepare for Mother Nature's wrath, and hence it's hard to blame the owner of this Porsche for letting it become a not-so-hot tub. Only Urkel adequately prepared for the rising tides, and I think he was pretty much partial to Isettas. That's too bad because a 911, while sharing a behind-the-driver engine placement and Germanic origins, is a lot more fun to drive. The question here though is whether this Porsche is worth $36,000 of fun? That's a lot of samolians for something that's been semi-submerged, but perhaps the seller isn't hiding doors and floors full of mold, along with prospects of future rust equatable to the sun rising each morning in the East. If that's the case then this is a kind of hot looking 993 that should provide years of Porsche pleasures. Or maybe, the seller is all wet. So what's your take on this once nautical 911, is that $36,000 a price that would whet your appetite? Or, does the whole prospect leave you high and dry? eBay or go here if the ad sinks. H/T to Stephen Hodgson for the tip!